Quality control samples like this would be sent back to Kenner from their vendors in the Orient so that they could be reviewed by the toy company. An engineer in charge of the line would typically have to sign off on the product, as well as make suggestions for improving it. 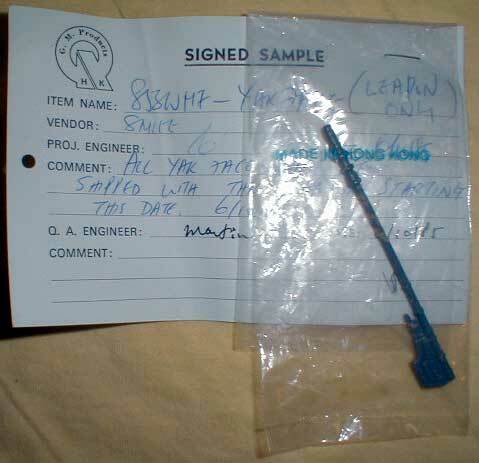 This sample concerns the weapon that was packaged with a number of figures, most notably the Power of the Force version of Yak Face. What makes it so interesting is the note: it says that all Yak Face figures need to be shipped with the weapon starting in June of 1985. Now, most Tri-Logo versions of the figure came with either a random weapon (such as the Sand Person's gaffi stick), or no weapon at all. But all POTF versions had this gray staff thing. So this sample is really setting the stage for the POTF Yak Face, one of the rarest, most notorious carded figures in the Star Wars range.